Hot dogs and sausages have been gaining popularity around the world owing to the taste, convenience, and variety they offer. The hot dogs and sausages market is being driven by varied consumption trends and patterns across different regions and seasons. The rapid development of the retail sector in emerging economies is a large opportunity for players in the hot dogs and sausages market and this has spurred the operational expansion of companies in countries such as China, India, Malaysia, the UAE, and the Philippines. 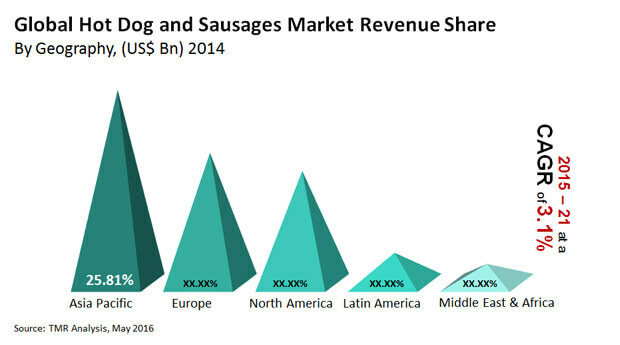 Revenues of the global hot dogs and sausages market were nearly US$64.7 bn in 2014 and are estimated to reach US$80.4 bn by 2021. The market is projected to register a 3.1% CAGR during the forecast period, reports Transparency Market Research. Hot dogs and sausages are made from a variety of meats: pork, beef, chicken, mutton, and lamb. Among these, although pork led the overall market, chicken is identified as the most attractive segment for the hot dogs and sausages market due to growing health awareness among consumers. There has been a global shift in consumer preference from red meat to chicken since the cholesterol content in red meat is higher than that in chicken. Furthermore, chicken does not contain trans fat, which is one of the main factors triggering coronary heart diseases. This is expected to increase the demand for chicken hot dogs and sausages during the forecast period. Additionally, chicken is comparatively cheaper and there are negligible religious barriers or taboos associated with its consumption. This is as an important factor in the growth of the chicken hot dogs and sausages market, especially in the Middle East. On the other hand, pork is an attractive segment in the hot dogs and sausages market in Asia Pacific, especially in China. The global hot dogs and sausages market has been geographically segmented into North America, Europe, Asia Pacific, the Middle East and Africa (MEA), and Latin America. In terms of revenue, Asia Pacific is expected to be the leading regional market for hot dogs and sausages, accounting for a share of more than 39% during the forecast period. The Middle East and Africa region, on the other hand, is predicted to be the fastest growing hot dogs and sausages market. The Asia Pacific hot dogs and sausages market is fueled by the rising preference for fast food among the younger generation in the developing economies of China and India. One of the major factors contributing to this factor is the increasing number of individuals belonging to the age group of 20-30. The hot dogs and sausages market in the Middle East and Africa is anticipated to witness significant growth during the forecast period due to the increasingly busy lifestyles of the working class, the growing frequency of major sporting events, and an increasing number of households with kids. In addition, extensive marketing strategies adopted by hot dogs and sausages manufacturing companies are slated to fuel the market in this region over the course of the forecast period. Some of the prominent companies competing in the global hot dogs and sausages market are Bar-S Foods Co., ConAgra Foods, Inc., Bob Evans Farms, Inc., Johnsonville Sausage, LLC, Sara Lee Food & Beverage, Family Dollar Stores, Inc., Boklunder, Atria Plc., Animex, Campofrio Food Group, Elpozo, Sigma Alimentos, JBS Argentina, and Tyson Foods Inc.